After Manali we have a long drive over two major passes to our next stop, the high altitude village of Kibber in Spiti. The Rohtung La (the Pass of Dead Bodies) is a high pass closed by snow for most of the year. Manali is a popular Indian honeymoon resort and the shacks at the side of the long hairpin road leading to the pass all have numbers: 999, 56, 88, 2, 173 in no sequence. As the shops start to open we see that they all have the same stock: Wellington boots, fur coats and "dungri sets" for the Indian tourists who've come to see the snow. All the coats and “dungarees” have numbers on the back and are for hire, the numbers tell you which shack to return them to. It’s the weekend so we're not delayed by too many lorries struggling up the pass on the narrow road. Eagles, blue poppies, vertiginous cliffs emerging through cloud. Ten miles before the summit is tent city: a collection of roadside dhabas, brightly decorated cafes with coloured plastic awnings and chairs. A stream has been dammed to make a tiny lake with a pedalo swan; red chairs and a table are perched high on a rock. 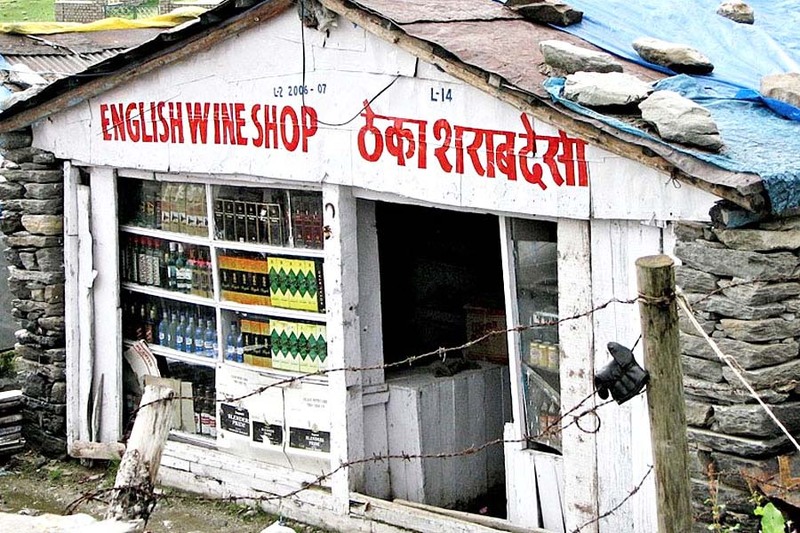 The “English Wine Shop” is well stocked with fake Johnnie Walker for the bus drivers. Not a prospect you want to consider on these winding roads. More chai and a quick walk clockwise round the Buddhist shrine overlooking the road. The actual summit is barely indicated before the road drops down through more hairpins into the drier, less monsoonal valleys of Lahoul. At the junction at Gramphu the main road heads north to Ladakh but we turn east on a rougher track towards Spiti. Last time we were here the sun was low, glacial melt waters flooded the road and we picked our way carefully between huge rumbling boulders. Colours today are less intense and the river less full but the mountains on either side of the river valley are still sharp edged, the ribbon waterfalls still fall a thousand feet to shatter on to black rock and the hanging glaciers are still brilliant in the bright sun. We pass two tents near the river by a camper van covered with a tailored calico shroud. Trekkers are sitting outside the overflowing Chattri dhaba but we drive on to Batal where I have some photos for the dhaba owners. The Chandra dhaba at Batal is a walled enclosure covered with yellow and blue tarpaulins just before the iron bridge over the Chandra River. It's a truck stop cafe with shelter and camping space. We rested legs here a couple of years ago after walking back from Chandra Tal, the Moon Lake, at the end of a long trek into Zanskar. Inside the tent the diners are bathed in yellow tarpaulin light; we sit towards the back on wooden benches next to the shelves of groceries. The owners are Tibetan, very friendly and delighted with the photos. One shows the woman brandishing two huge moulis, radishes. For the last three years we've referred to her as Mrs Mouli. She shows the photo to everyone in the cafe, several times. They remember our previous driver, a small Tibetan called Tsering who was planning to go to live with his much larger wife in New York. Now it seems there is some confusion whether he or his brother went to New York. And with which brother’s wife? It's hard to leave; I'd like to stay here overnight sometime, maybe at the start of a trek to the north. Within an hour we're at the Kunzum La, at 15,000 ft, the pass that announces Spiti. Blue sky, 360 degrees of snow covered mountains, prayer flags slapping in the wind and three brightly painted Buddhist chortens standing guard. All vehicles divert from the road here and drive clockwise around a prayer wall to pay respect to the gods of the pass and hope for a safe journey - which is not guaranteed, out of season it would be an exposed and remote place. A group of Kinnauri women walk from shrine to shrine, touching the stupas with their foreheads. Streams fall from glaciers and the valley becomes greener as we descend from the pass. We see our first Tibetan houses, white walled, flat roofed with a parapet of winter fodder and fuel. Prayer flags on tall, thin branches at the four corners of the roofs. 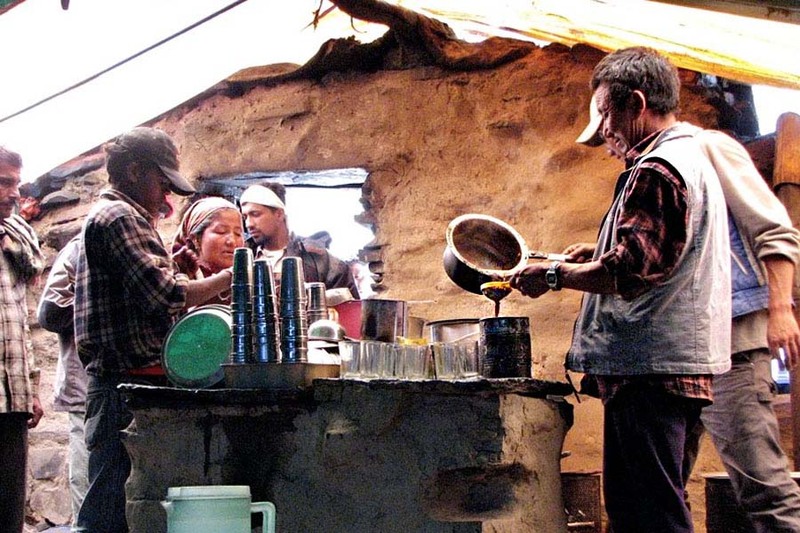 At the busy village of Losar there is time for chai while the police check our permits. Roadside stalls are lined with brightly coloured bottles of fizzy drinks, water, jewellery and eggs. Headscarves on the young girls, polo hats on the boys. Wind burnt cheeks, smiles. 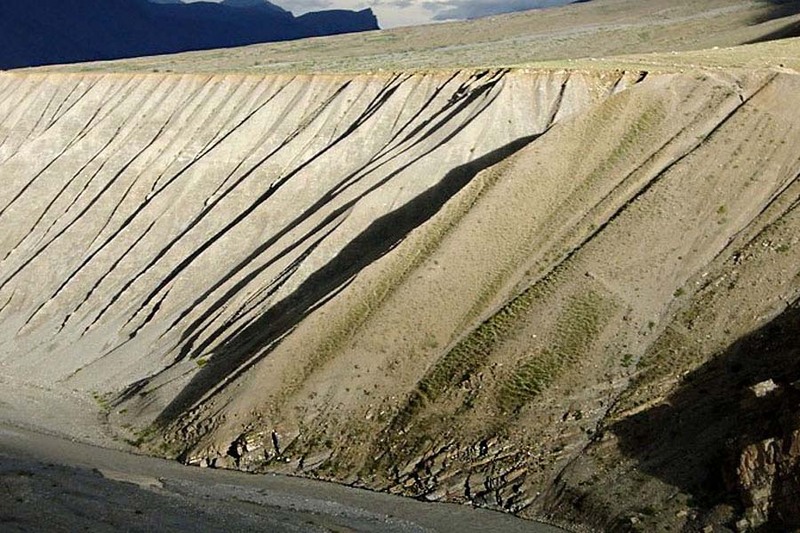 A winding canyon leads onto a plain above the Spiti River. The road hugs the vertical rock face as we approach black clouds pierced by dramatic light illuminating the mountainsides. In the distance, on the far side of the river, we can see white buildings built into the top of a conical hill - Ki gompa is catching the last light of the day. 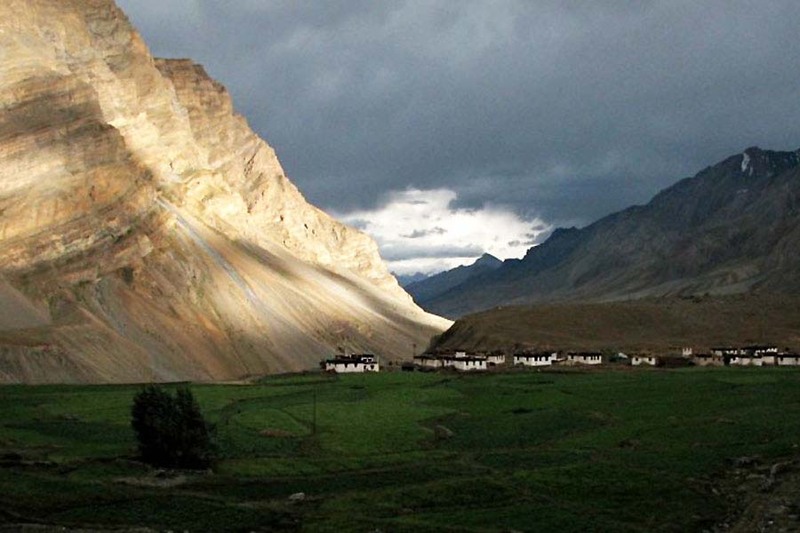 Ki is one of several monasteries in the Spiti valley dating back a thousand years. 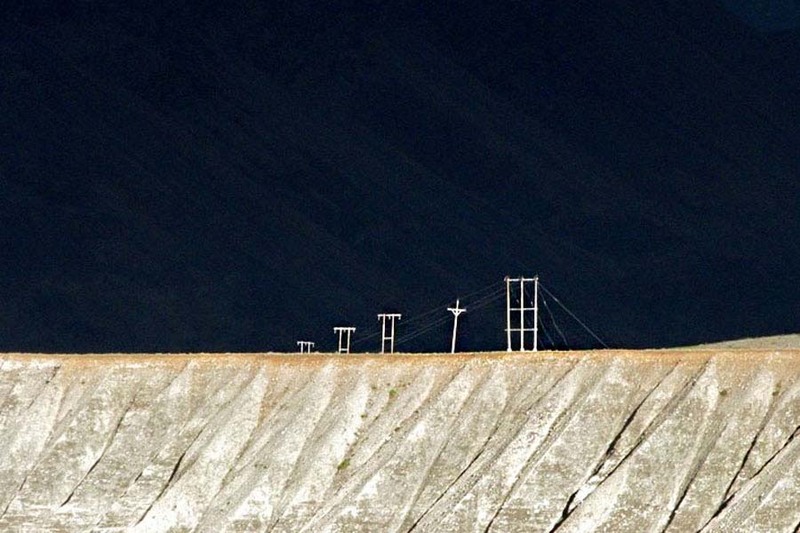 The road runs parallel to the Spiti River; the plain falls down to the river in tall fluted ridges, for one brief moment a line of telegraph poles is illuminated against black mountains. At Rangrik a large Buddha is built into the hillside below the words Om Mane Padme Hum marked by white stones on the grey-black slopes. We cross the river and drive in the dark to Kibber, aware that, especially for our driver Jan Singh, this has been a long day. 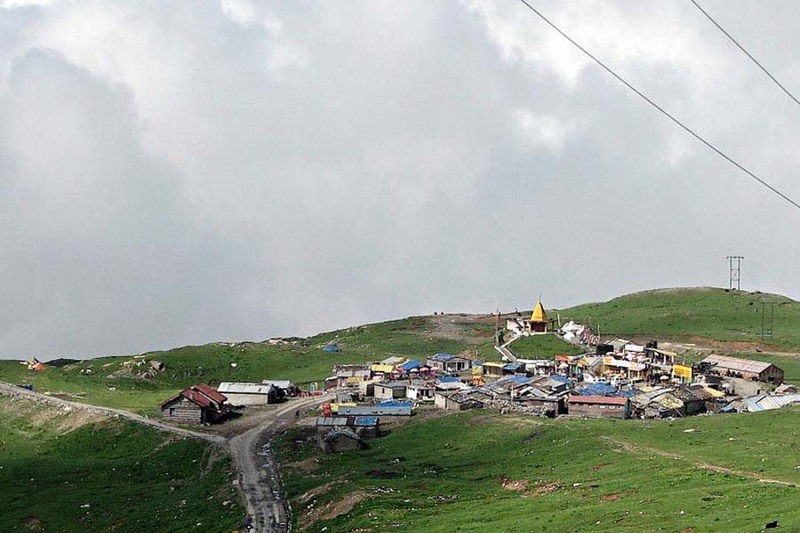 Kibber claimed to be the highest village in the world connected by a motor able road. No longer the case but, at 14,000 feet, still high. We’re lucky to get our basic but charming room - with sofa - in the Tibetan Norling Guest House, lucky as the booking had been made for the previous day. 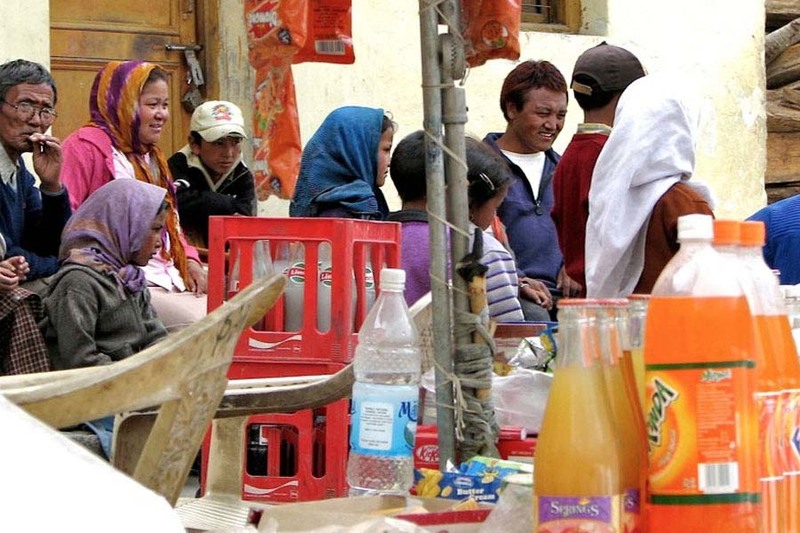 There are balconies with views over the village, friendly hosts and guests who’ve walked from Ladakh. We have a dull meal of noodles cooked by our friendly Tibetan host with a very dirty white vest. And beer. Proper beer.